One reason I am a bit obsessed with Facebook is because of all the connections I make through this site that I perhaps otherwise would not have made. 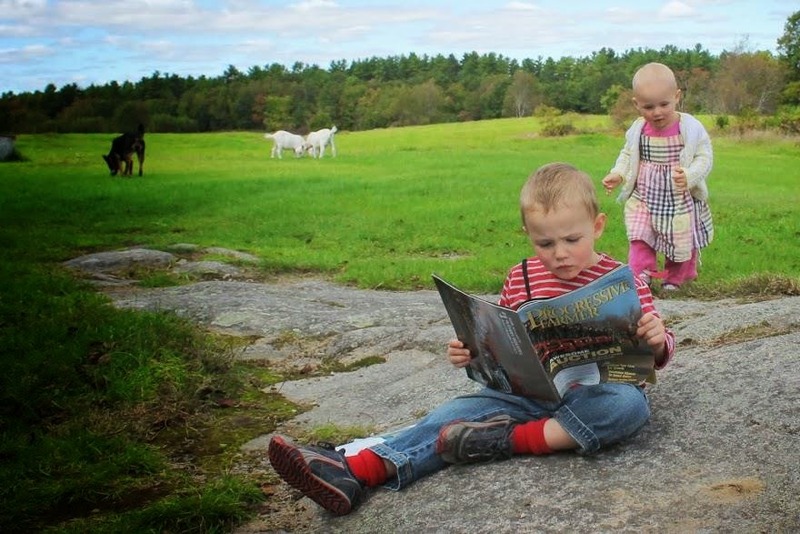 Finding the Maine native Jackie Lipsky's blog, born imaginative is one such gem I just happened to stumble upon while mindlessly scrolling my newsfeed a couple of weeks ago. Jackie held an open house on her farm in Maine, which happens to just be around the corner from my house. This old farm house, with the most beautiful porch and large open field in the back, this one that I've admired countless times as I've driven home from the farm stand up the road. 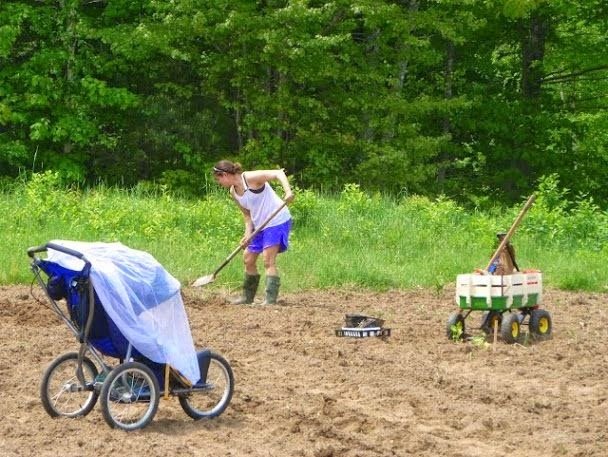 She invited some moms and babes over to enjoy her farm animals, field, hear the train, and play some musical instruments - something that's important to her, sharing this wonderful Maine life with others. 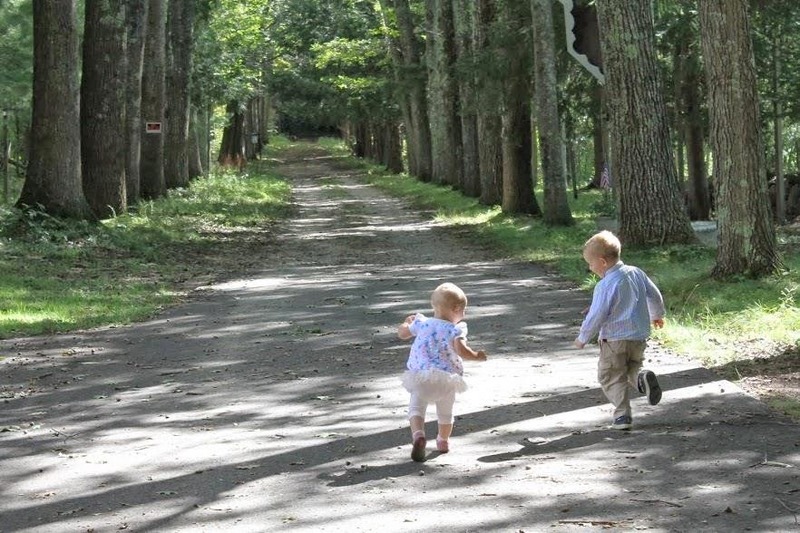 You can see our visit to the farm here http://themommystories-friends.blogspot.com/2014/07/a-trip-to-farm.html. Jackie not only has this amazing farm, but she shares her beautiful life - and astounding photography skills - on her blog and is also on Facebook. You MUST check these out! I have been caught up reading her old posts about dresses she makes every month for her daughter and homemade bread and pancake mix recipes, staying current with her just about daily posts now, including thrift store finds - my favorites! I'm so mesmerized by this fellow mom's ability to create, nurture, raise, and grow such beautiful creatures and handmade things and foods on a daily basis. It's a beautiful life, that I can see, this life she's created on this big old farm. Her children are the luckiest around, that I also can see from their smiling faces on her blog. 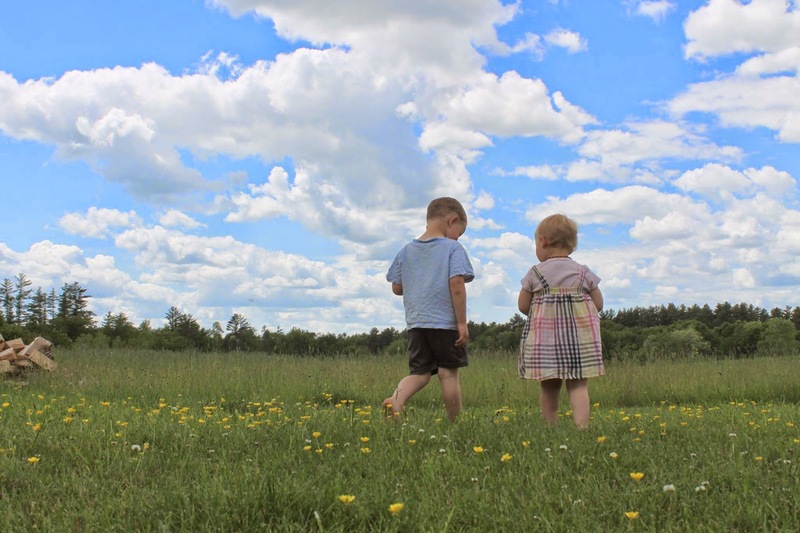 Her blog serves as such a nice, gentle, real reminder of getting outside with the kids, exploring nature, and being happy with what's around you rather than searching for more through other means. Especially this season of summer in Maine, it's such a nice time to appreciate our surroundings. Thanks, Jackie, for sharing a bit of your home and life with us. My goal in featuring this fellow mommy blogger is not only to share an awesome blog with other moms, but also that perhaps one mom will be inspired to create something awesome with or for her children based on something she read on the born imaginative blog. Be creative, moms, have fun with this one wild and carefree life we have! 1. How long have you lived at this farm house? This home is the home I dreamed of living in when we first moved to the area in 2006. We lived a half mile from this home and I used to visit the woman who lived here. Sadly, she passed away and the home became ours in 2012. 2. Why did you want this life for your kids? What enticed you and your partner to want to buy a farm house? I grew up in an old farm/farmhouse in rural northern NY. We had a horse, cows, sheep, pigs, chickens, rabbits, dogs and cats. We caught frogs, picked wildflower bouquets, fished in the pond and caught butterflies. We made forts, grew vegetables, played in the haymow. We lived outside. We got dirty. We did not have TV, but never missed it. That was the childhood I had and the gift of a childhood similar is why we live where we do. 3. 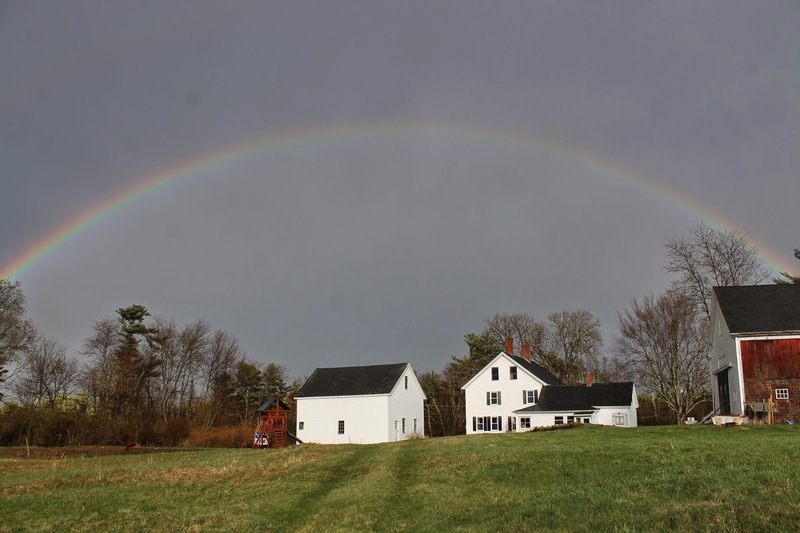 What do you envision for your family in this house, with the farm, growing older here? Homesteading and sustainability is what I foresee. Staying home, growing, creating, making from scratch and embracing the simple life with open arms. We are so humbled to live in a place such as this, sharing our homestead and bounty with others is a priority. 4. What types of animals do you have currently? I currently feed 68 mouths on this farm now. My husband, children, dog, cats, rabbit, goats and chickens. 5. What types of things do you enjoy the most in your life right now, especially at your home/farm? It is not possible to fully list that which I enjoy, as there's so much beauty around us and so many special moments to treasure. Right now? Sitting on my screen porch, dog underfoot, listening to the rain. Earlier today? The squeals and laughter as my children sprinted through the yard in their underwear at sunset. Tomorrow? The celebration that awaits us as my little girl turns 2. There's joy all around us and the joy crescendos with the changing seasons. The first crisp days of fall I am enthused to harvest my pumpkins, make apple pies and transplant my annuals. The first snowfall motivates me to dig out a quilt to work on, start a fire and indulge in warm homemade bread. The first sight of robins, worms and tree buds excite me to garden plan, start seedlings and pull out my mud boots. The first long days with sunshine make me think of kayaking, picnics and hammocks. There really is joy all around us, at all times of the year, provided we slow down long enough to notice. 6. When did you start your blog, and what was your goal in starting the blog? I started in 2011, as a way to journal our life for my children. My mom became sick when I was 10 and passed away when I was 15. She has boxes of notes and pictures she meant to do something with and never got around to it. I wanted to keep better track of our life for my kids. I hope I get to watch them grow, but if I do not, they will know a lot about their mama. I never expected to have such a following or gain so many regular readers. I'm thankful for the kind blogging friends who follow so loyally and say such kind things to me. It really means a lot. 7. What do you hope your readers learn from your blog? I blog for myself and for my kids and the fact that readers learn from me is humbling. I do not create anything specifically for the blog. I just do what I would be doing whether or not this blog existed or not and use the blog as my journal. I do share the recipes and some of my patterns in case others are inspired to give the creation a whirl. I guess what I hope most is readers find me a kindred spirit-someone who has a desire to do better, has a bit of bravery to give something a whirl and someone who is determined to end triumphantly despite life's busy obstacles. I'm really no different than others, I'm just doing what I enjoy. I just happen to blog about what I enjoy as well. 8. What advice would you give to moms who want to be similar to you by being creative, ambitious, and making their own foods, toys, etc. ? What has helped you along the way? I think one of me in this world is plenty and I think my husband agrees! It's not about being similar to anyone else, it's about digging deep and creating your own vision and developing your own interests. It's about making time for that which you want to do, even if it's just a five minute a day commitment. I think what has helped me most is believing I can and I will. I think we all are born with creative energy, just dedicating time to use the creativity is the challenge. 9. What are some things you are proud of creating so far? My children. Everything else I have created can be replicated. But my children are one of a kind. 10. 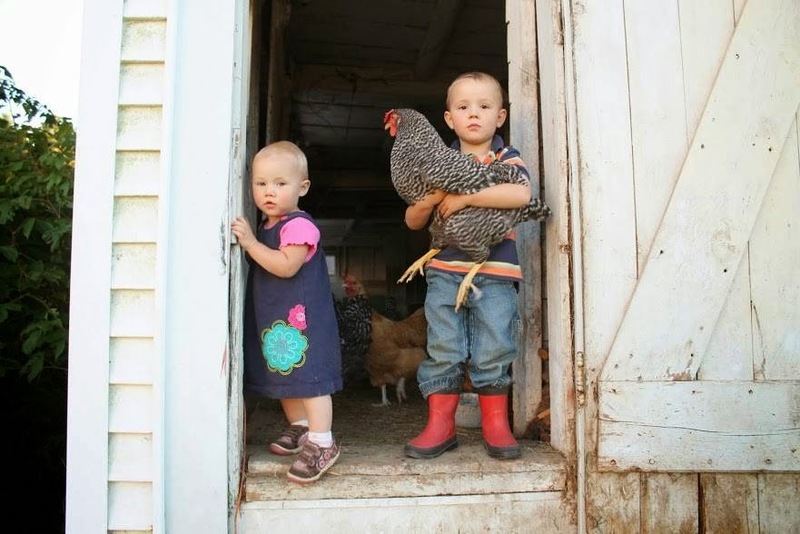 What do you hope your kids learn from living in this farm house and in this life outside, with homemade things, etc.? I hope they learn simplicity, hard work, creativity and togetherness are what opens the doors to make learning fun. 11. Why is it important to teach our kids to be creative, use their imagination? What is your advice to the average mom for trying to encourage creativity in their children? The world is full of things that think for us. We are smarter than technology. We don't need electronics to think for us. We also don't need 'stuff' to encourage creativity. Go outside, there's rocks, sticks, dirt. Or hand over a pencil, scissors and junk mail. Creativity is fostered through free time and items that allow imagination. for the love of strawberries! summer adventure - Philadelphia Zoo! Mom of the Month - Nicole Burke!